Families discover that going to see relatives and friends comes at a high price. Cao Li in Beijing and Li Xinzhu in Shanghai report. Yi Linhua lays a fat wad of red envelopes on top of bags of milk candy, bottles of white liquor, packs of cigarettes and dozens of gift parcels. 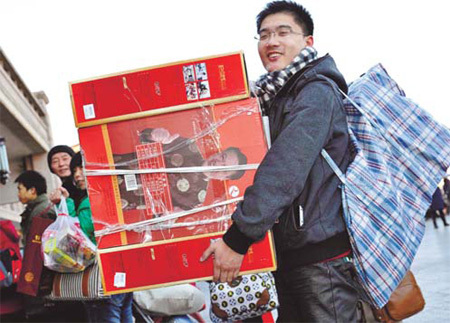 The 30-year-old IT salesman in Shanghai and millions of other white-collar workers in big cities are going home for the most important Chinese holiday. The one-week reunion is at a cost. To Yi and his wife, who have a toddler to provide for and a mortgage to pay, it is nearly two months' household income. "There is always pressure to go home. But you have to go," Yi said. "The big family is waiting for us. After working away from them for one year, going home with wife and child shows my respect and gratitude." Yi and others who migrated from rural regions are feeling a growing financial burden from the tradition of giving money or gifts for Spring Festival. Some say the lunar new year produces not only a large human migration but also a major migration of wealth. For Yi, the total this year is about 30,000 yuan, including 12,000 yuan to his parents and parents-in-law, more than 30 red envelopes to nieces and nephews, and extra money for children of distant relatives who might visit unexpectedly. "The amount I put in the children's envelopes, varying from 50 yuan to 500 yuan, depends on how close we are with their families and how much help they have provided to my parents when I am away," Yi said. "I am broke after every Chinese New Year." Hua Xu and Fang Jingjing, both from northwestern Gansu province, will spend 20,000 yuan for the holiday, about one-seventh of their 150,000 yuan annual income. "When we are giving as much as 1,000 yuan as a wedding gift to friends, we can't just give our parents 2,000 yuan for new year," Fang said. She feels guilty for not taking care of her parents and sees giving money as a way to make up. She has doubled the amount to 4,000 yuan this year. Jin Wen, a 26-year-old in his second year as a civil servant in Shanghai, said he will start paying red envelopes this year worth 10,000 yuan, which is two months' salary. "If I still go home with hands empty, both my parents and I will lose face."